We are proud to announce the opening of our retail store and water test lab! 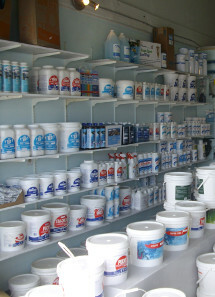 Stop by for all your pool and spa accessories, maintenance products and chemicals. Our state of the art Taylor® WiseLAB is certain to provide you with an accurate analysis and prescription for any size or style of pool and/or spa. Taylor® is a company that does not sell chemicals, but does sell the highest quality testing reagents. We are committed to providing all of our customers with only the best quality products and first class advice. Pumps, filters, heaters for in-ground or above ground pools or spas; you want it, we have it. Along with all the pipe, fittings, primer and glue you need to get the job done. We have all the maintenance equipment you need as well. Vacuum poles, heads, hoses, brushes, skimmer nets and more. Every test we do here you can purchase a kit to do at home yourself. 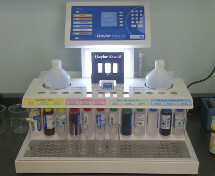 Whether it’s just a simple chlorine and pH kit or an advanced phosphate kit, we have many styles and types of test kits. Make it easy on yourself and use test strips… simply dip the strip and compare the colors to the chart on the bottle. Testing water has come a long way in the past few years. We have been using and selling pool chemicals manufactured by Mursatt Chemicals Ltd. since the mid seventies. They are a Canadian owned company based in Ontario and have provided Don and staff with exceptional training, products, information and services. Mursatt buys and sells the best and safest materials available. They contain the least insolubles of any other brand, so you know you’re not adding anything unnecessary to your pool. Another line of chemicals we carry are manufactured by Natural Chemistry, leaders in “Green” chemical production. Many of their products are enzyme-based and are not harmful to the environment. We use their product “Phos-free” as an excellent way to eliminate phosphates from pool water. Those customers accustomed to the Sani-Marc brand of chemicals will be pleased to find that we carry many of their products as well.